Bronze eyeshadow is a failsafe, but beautiful shade for your lids all year round as it compliments every eye colour and suits a multitude of skin tones. In the warmer months especially I find myself reaching for the bronzey hues a lot more and they are continually in rotation in my daily make up routine. For this reason, I thought I'd share with you, in my opinion, the best of the bronze. This is definitely a favourite of many bloggers/vloggers and I can see why. Although I've had this for a while and have used it many times, I've only made the tiniest dent in it. This is mainly due to how bloody pigmented this stuff is!! A little goes a long way, but do not fear! If you do apply a little too much it is easily blended out with either your finger or a blending brush of your choice - (if I've really made a mess of the whole sitch then I like to use a dense, synthetic round top brush to blend it right out to reverse the damage I've done!). Once it's set though, there is no going back as this does not budge/crease until you get your make up remover on this bad boy. Seriously. The colour of this is really pretty too, it's quite metallic but it isn't as warm toned as the other ones featured in this post. I really like that as I think it suits me when I'm really pale or when I have a bit of a (fake) tan. If you have read my blog for a while now, I used to use this quad all the time for any eyeshadow looks. I think Rimmel have changed the packaging a little, and possibly the formula but I think the same quad is still available. In the swatch above I used the second darkest colour (top right of the quad) as I think this is the bronziest shade of them all. The formula of the eyeshadows could be a little bit smoother as I find they can feel a little rough and chalky. Nevertheless, these eyeshadows are highly pigmented and blend dreamily with each other and other shadows. The quad itself has a nice range of shades going from light to dark, allowing you to create a variety of looks going from soft to sultry. The only downside to the quad is that they are all shimmery shades so there are no mattes for the crease. I know a few bloggers have raved about this shadow as it is beautiful all over the lid for a quick wash of colour or it can be built up for a more intense look. Personally, I prefer the former as you can sweep it over the lid and blend it up into the crease and it looks as though you have put a lot more effort into your make up than you actually have - perfect for those early starts or when you are running a little late! Using a primer underneath, this eyeshadow doesn't crease throught out the day but it can fade a little if you're wearing it for a super long time. The formula for this mono eyeshadow from Rimmel is a lot nicer than the quad I just mentioned. I'm not sure if this is because it's a single eyeshadow or because I have had the quad for years! I saw Kate from gh0stparties using this shade in a make up look on YouTube a while back and it looked so beaut on her I knew I needed it. It's quite a unique shade as it has almost a pink sparkle running through it, I can't describe it but you may be able to see in the swatch. It is a little chunky and can create some fall out if you get a little too much on the brush. Similar to the Rimmel Smokey Quartz, it looks beautiful as a wash of colour all over the lid or packed on for an insanely beautiful and shimmery look! Ahhhhh. Possibly my favourite of the bunch. Why? Well, it blends like a dream for starters, creating a seamless bronze goddess type scenario, mainly due to the formula, like all MAC eyeshadows, is on point. The shade of it is perfect with just the right amount of shimmer, making blue eyes pop. It's so wearable and I can imagine it would go with any outfit/ lip colour. This is definitely my ultimate go to eyeshadow all year round. 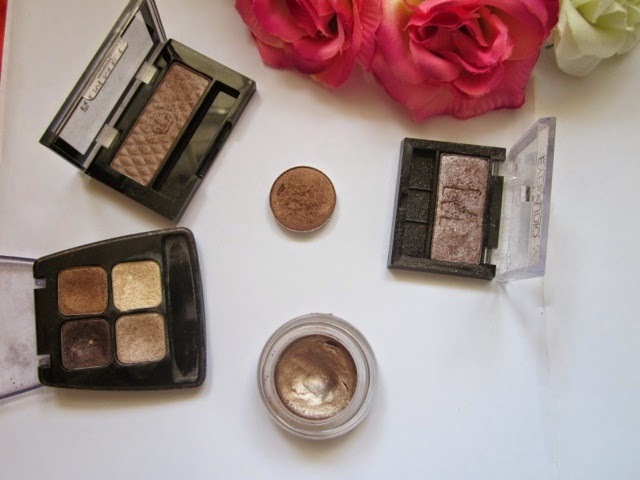 That's it for the lowdown of the best bronze eyeshadows! Have you got any faves that I haven't mentioned? 3 comments on "BEST OF THE BRONZE"
i love the maybelline colour tattoos! 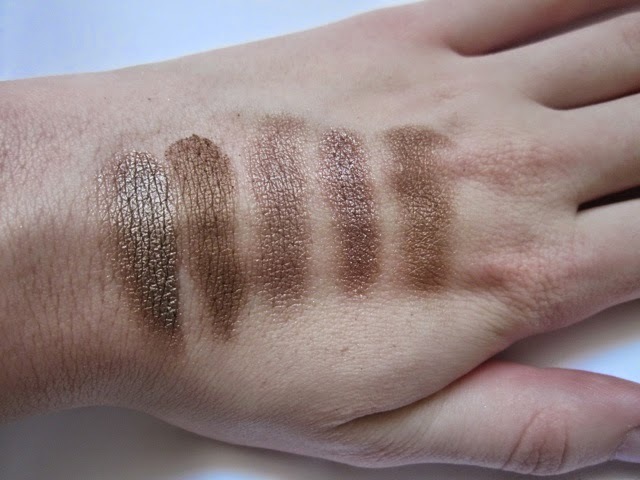 and one of my favourite bronze products is the rimmel shadowstick in bad bronze!